Organizing a successful conference requires planning, expertise, preparation, and dedicated resources. Make sure the date you select should not intersect with festivals or any big events, it will make difficult for participants to travel during that period. Never plan your conference or seminar during holidays (summer & winter) people want to spend that time with family not in a conference. Try to keep your event at the end of the week as people don’t have to take any special leave to attend your event. Select the location where people can commute easily and if possible, select a good city where all the facilities of transporting other stuff are easily available. It’s the key to planning a conference it helps you to know how much you want to charge for your conference. Make a big team which will help you to carry out all the others duties. Allocate duties by area. For example, someone is responsible for the conference registration area, someone else for receiving the speakers, a different person for the gear, for catering, communication with the press, etc. Every person needs to have his or her area, which he or she should be in authority throughout the entire duration of the conference.Give every member of the team a document with the assigned duties, so that every person knows whom to contact for any specific matter. 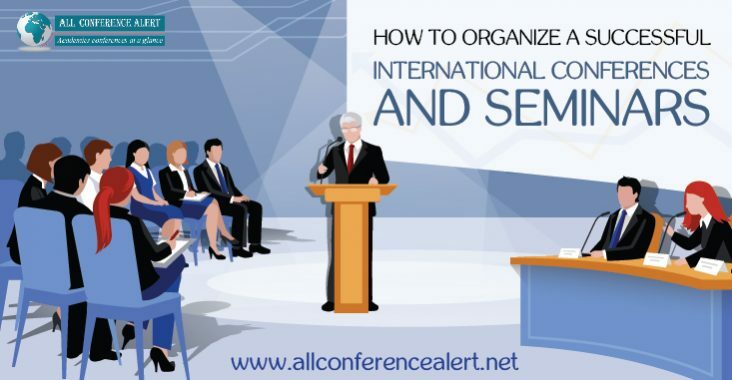 Registration is an important part of your event so make sure that make sure people get enrolled in your conference, there are few websites like www.allconferencealert.net which help the people to find about all the international conference 2019. And help people to get register in that conference. Do not undervalue the time required for the successful promotion of an event. The kind of event, its target audience, internal resources, and the budget all determine your marketing tactic. When choosing your media associates, focus on those who will target your audience. It’s better to have a few associates but targeted ones.It is also important to generate one key message that will be broadcast on all channels. Be friendly to participants, speakers, and associates. Try to speak their problems or questions and meet their expectations, even if you feel tired and not everything goes as per plan. At the end of the day, people will only remember is how they were treated. Make sure that you’ve informed the members on how to get to the location, invited all the important people, and prepared the printed resources, audio and video content. Check whether everyone understands his or her tasks and duties and whether space is organized. Ask participants to complete a printed feedback form at the end of the event or an online form when they get home. Ask them to judge various aspects of the event like logistics, speakers, locations, and the work of the organizers. This information will assist you to avoid mistakes in the future and increase the quality of your events.